Modern East Asia: An Integrated History 1 Edition Places the histories of Japan, China and Korea in a global as well as regional perspective. 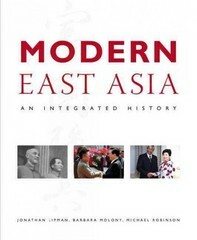 Modern East Asia details the history of the region while recognizing the intellectual, religious, artistic, economic and scientific contributions East Asians have made to the contemporary world. The three national narratives of China, Japan and Korea are told separately within each chapter, and the text emphasizes connections among them as well as the unique evolution of each society, allowing readers to experience the individual countries' histories as well as the region's history as a whole. The text takes into consideration the radical changes in the field of history in the past 40 years, as the authors have incorporated scholarship in areas such as gender studies, social history and minority histories. While reading social, economic and personal histories, students will uncover the evolution of family structures, peripheral and outcast communities, the sociopolitical power of language and literature, the rise of nationalism and regional trading networks. Attention is also paid to environmental and diplomatic themes. Note: MySearchLab does not come automatically packaged with this text. To purchase MySearchLab, please visit www.MySearchLab.com or use ISBN: 9780205197019.